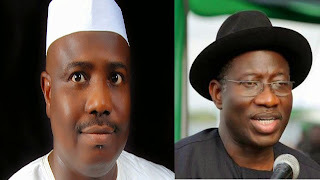 The Speaker of the House of Representative, Aminu Tambuwal has asked the President to negotiate with terror group, Boko Haram if that would secure the safe return of the kidnapped Chibok girls. The speaker said this today July 15th while receiving the leadership of the #BringBackOurGirls campaigner in his office at the House of Assembly. "If negotiations is what would bring back for example Chibok girls, for Goodness sake, lets negotiate and save the children. Negotiation is not submitting......you are not just submitting, you are not. It is a strategy. So let's get these girls out and then if you want to confront them you go ahead and confront them and take them head on but whatever we need to do, we must do as a government to bring back these girls safely & alive" he said. He urged the campaigners to continue with their demands for accountability.